Dalea candida (Fabaceae) (50x35,Z4,P,SC,1) .............................................................. 100 seeds / $3.00 12090.02 Essentially a white-flowered version of D. purpurea. Dalea jamesii (Fabaceae) (6x15,Z4,P,SC,1) ................................................................ 20 seeds / $4.00 50086.45 (W) Fremont Co., CO, 5900ft, 1800m. Tufts of silvery-green, fingered foliage carry elongated balls of silver wool embedded with lemon yellow flowers. The whole plant is aromatic of lemons. 70458.14 (W) Benton Co., WA, 350ft, 107m. 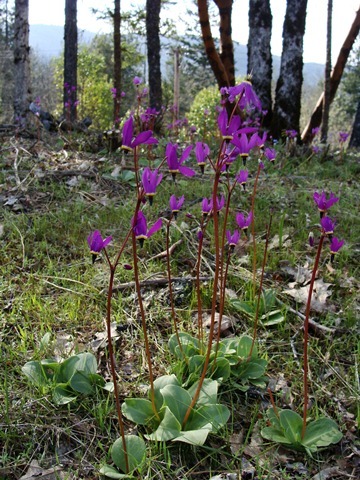 Eye-catching fat spikes of bright violet. Columbia River Basin. 70884.11 (W) Pima Co., AZ, 4000ft, 1220m. Balls of purple flowers in early spring. Silvery shrublets. 70905.12 Showy legume with purple cylindrical flower heads at the end of multiple branching stems. Dalea villosa (Fabaceae) (30x35,Z5,P,SC,1) ................................................................. 40 seeds / $3.50 90484.04 Attractive perennial on account of the hairy (villous) pinnate leaves and long (3" - 5") spikes packed with lavender flowers. Dasylirion leiophyllum (Agavaceae) (110x110,Z7,P,C,1) ......................................... 90 seeds / $3.50 54249.27 (W) Eddy Co., NM, 4425ft, 1350m. Globular rosettes of green, narrow leaves with sharp, retrorse teeth. Huge spikes of thousands of cream florets packed in multiple spirals. Dasylirion wheeleri (Agavaceae) (110x110,Z7,P,C,1) ................................................ 90 seeds / $3.50 92355.27 (W) Grant Co., NM, 6800ft, 2073m. Globular rosettes of narrow leaves covered with a bluish bloom, the sharp teeth forward-pointing and the tips frequently twist. Huge spikes of thousands of cream florets packed in multiple spirals, similar to D. leiophyllum. 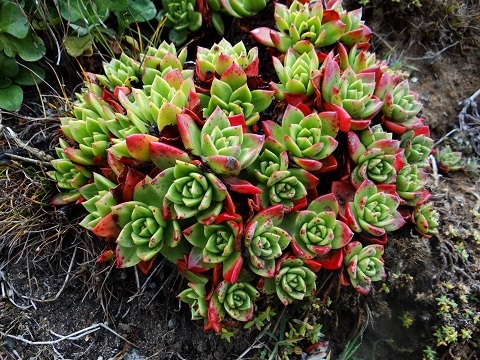 12670.14 Succulent, creeping stems of deep green covered with rosy-magenta flowers all summer. 30678.19 Green tufts bear white flowers all summer. 50665.19 A vigorous mat-former with abundant magenta-pink flowers. 32743.06 Ex Ouberg, Graaf-Reinet Division, RSA. A mound former with small pickle-like leaves and one-inch white flowers all summer until frost. 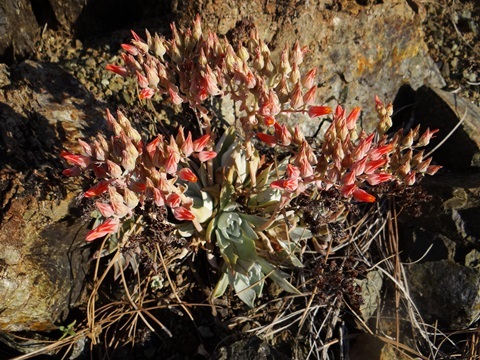 Collected on cliffs in the East Cape mountains. 76711.18 Abundant brilliant magenta-ruby flowers are about 3/4" across. 76710.01 Low-growing plants are covered with deep magenta flowers which fade to pink. 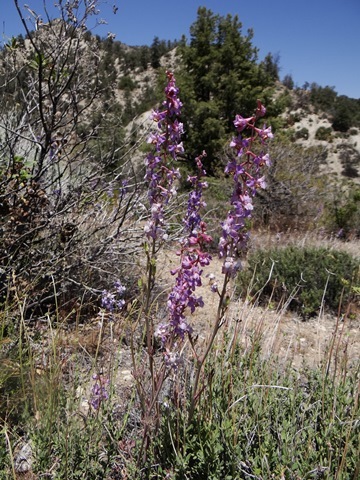 08815.35 (W) Mono Co., CA, 7835ft, 2389m. Spectacular, compact racemes of deep indigo blue over basal, fleshy, grayish-green, dissected leaves. 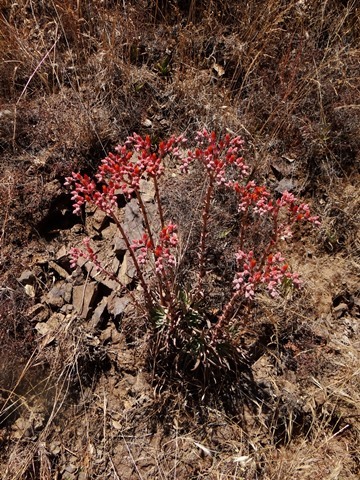 In rocky, volcanic soil. 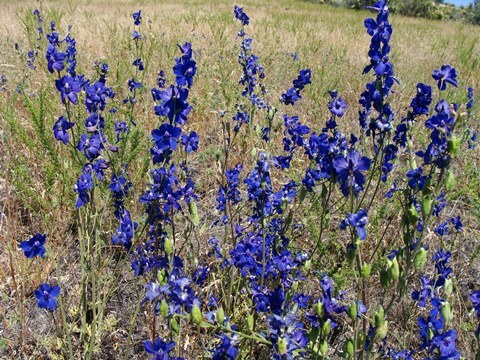 Delphinium bicolor (16x7,Z3,P,L,3:12w) ................................................................... 100 seeds / $4.00 10415.18 (W) Big Horn Co., WY, 9400ft, 2866m. One of the dwarfest, only a few inches tall. However, in some of the shaded gullies, they’re over a foot. Attractive flowers of deep blue surrounding a white bee. Delphinium bicolor (16x7,Z3,P,L,3:12w) ...................................................................... 100 seeds / $4.00 10415.28 (W) Park Co., WY, 7650ft, 2332m. Another population here in the Absaroka Mountains. 10904.19 (W) Klickitat Co., WA, 300ft, 91m. Dark-blue flowers spikes over tufts of gray, finely-dissected leaves held upright. 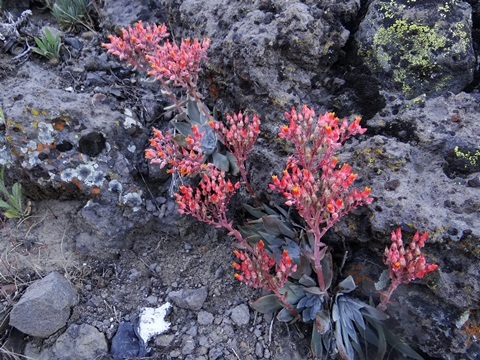 Growing in clay soils on basalt terraces. 12104.14 (W) Fremont Co., CO, 5350ft, 1630m. Beautiful spikes of white flowers with darker markings around the bee. 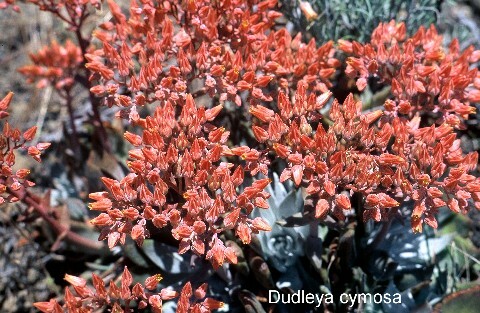 A dryland species which aestivates during the summer. Dissected basal foliage. 32543.15 (W) Jackson Co., OR, 6600ft, 2012m. Dense spikes of blue-purple over glaucous blue-green foliage. 32970.15 (W) Fresno Co., CA, 600ft, 183m. Pale pink, pale lavender and ethereal blue shades here. 35088.25 (W) Kern Co., CA, 1600ft, 488m. 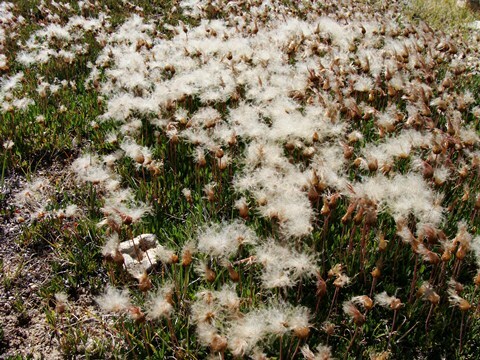 Hairy stems and leaves with flowers of white to pale purple. Delphinium menziesii (16x10,Z4,P,L,3:8w) ............................................................. 60 seeds / $3.50 56288.11 (W) Linn Co., OR, 5200ft, 1585m. 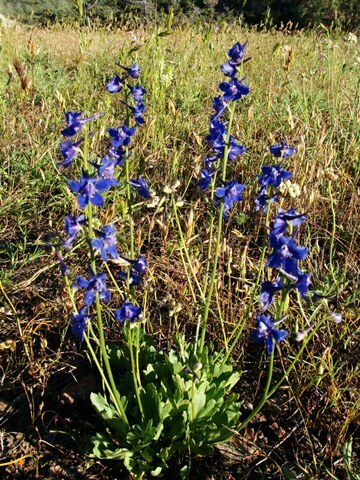 Similar to D. nuttallianum with short racemes of dark blue flowers. On volcanic tufa and breccia. 58720.17 (W) Lincoln Co., NM, 10100ft, 3079m. Imposing plants with luxurious, cut, basal foliage and stout stems bearing up to 100 or more purplish-blue to lavender flowers. 64212.38 (W) Park Co., WY, 9350ft, 2851m. Dense spikes of pale blue to cream-colored flowers with a darker blue bee. 70104.45 (W) Clark Co., NV, 2300ft, 701m. 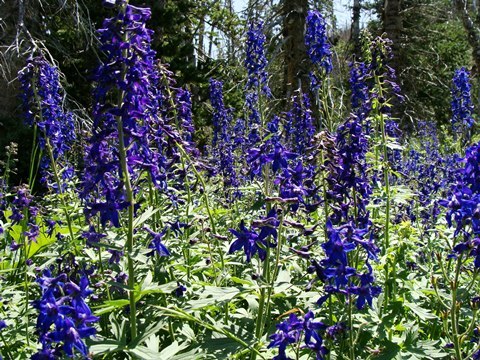 The rains in southern Nevada in late 2004 prompted a mass bloom of this Delphinium. The dense racemes bear downy flowers in a pale azure-blue with a white bee, almost luminescent by moonlight. 70104.55 (W) Inyo Co., CA, 4500ft, 1372m. Dwarfer form here on granite hills. Same azure blue flowers. 76132.15 (W) Yavapai Co., AZ, 6000ft, 1829m. Deep sky-blue flowers with white bees over mere tufts of glabrous, incised leaves. On vernally-moist basaltic meadows. 90506.10 (W) Chelan Co., WA, 3300ft, 1006m. 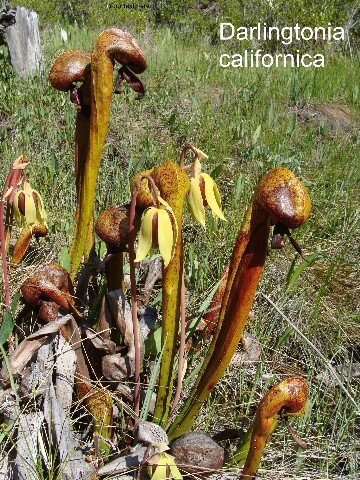 Narrow, dense spikes of pubescent greenish-brown flowers. More odd than beautiful. In vernally wet meadows with a basalt substrate. 94088.26 (W) Chelan Co., WA, 3500ft, 1067m. 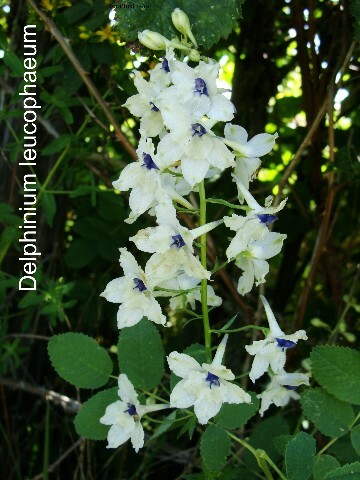 Creamy-white flowers, sometimes with a pale yellowish cast, in a stout raceme over palmately-dissected leaves. There are green or blue markings near the bee. On volcanic loam. 48454.17 (W) Bent Co., CO, 4800ft, 1463m. Erect plants looking very much like a small Mimosa with pinnate leaves and small clusters of white flowers which transform into attractive seedpod balls. Dicentra chrysantha (Fumariaceae) (100x35,Z6,P,L,4:8w) ...................................... 100 seeds / $4.00 12376.16 (W) Ventura Co., CA, 5800ft, 1770m. Bushlets of thrice-cut blue-gray foliage bear panicles of yellow flowers, the outer petals recurved. An interesting perennial for the back of the border. 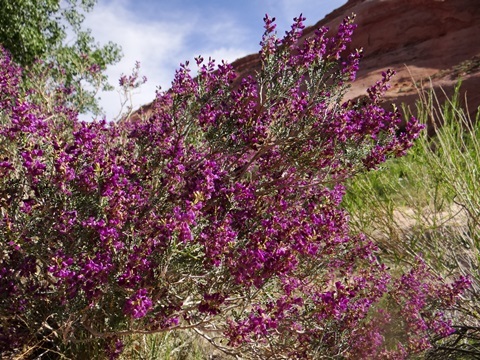 Thrives in desert areas with a long blooming season, especially if given extra water. 70887.28 (W) Yavapai Co., AZ, 4400ft, 1341m. Pretty umbels of dark lavender to blue flowers. The lone desert member of this genus. Dichelostemma volubile (Liliaceae) (120x6,Z6,P,L,3:8w) ............................................... 25 seeds / $4.00 90684.33 (W) Lake Co., CA, 2175ft, 663m. 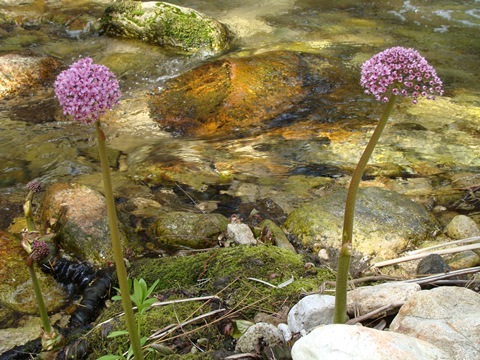 Twining stems terminate in umbels of rosy-pink to purple. 48890.19 (W) Larimer Co., CO, 9300ft, 2835m. Multiply-stemmed, small shrubs with broad, ovate leaves and yellow flowers along the stems, followed by decorative purple-black berries surrounded by a bright maroon calyx. 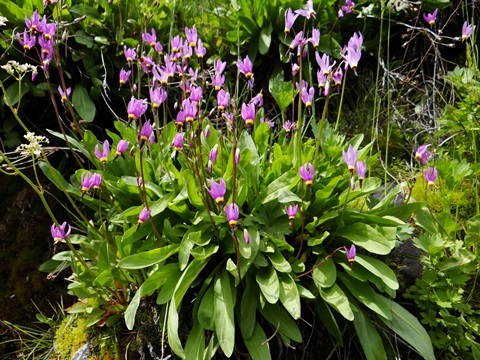 Dodecatheon amethystinum (Primulaceae) (28x12,Z5,P,L,3:8w) .............................. 100 seeds / $3.50 05630.06 Clusters of nodding, purple to violet-pink flowers, the tubular base ringed with maroon, yellow and white. Found in nature on limestone bluffs in the upper midwest and in the Appalachian Mountains. 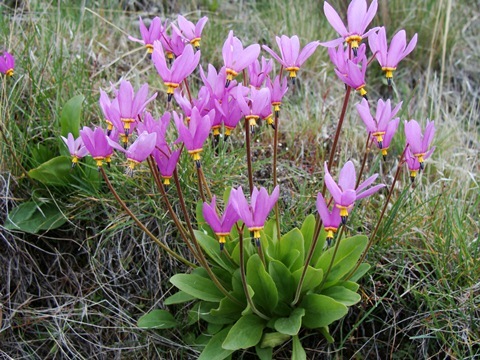 Dodecatheon clevelandii ssp. insulare (Primulaceae) (12x8,Z6,P,L,3:8w) ................ 100 seeds / $4.00 12545.36 (W) Santa Barabara Co., CA, 3800ft, 1160m. Flowers not seen here but are most likely lavender to pink, several per starburst cluster. Plants are considerably smaller here at this higher elevation compared to ssp. patulum. 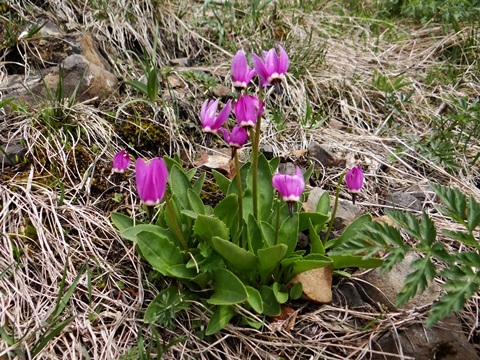 Dodecatheon clevelandii ssp. patulum (18x15,Z9,P,L,3:8w) .................................... 100 seeds / $3.50 12546.20 (W) Ventura Co., CA, 350ft, 107m. Star-bursts of several lavender-pink flowers with black anthers. 50260.29 (W) Idaho Co., ID, 7400ft, 2256m. Somewhat shorter plants with more flowers per head compared to the Oregon population. Flowers not seen. 50261.15 (W) Siskiyou Co., CA, 6800ft, 2073m. An old taxon which I retain here to emphasize the dwarfer stature of this population. Oblanceolate leaves, gradually narrowing to the petiole. Deep lavender flowers. 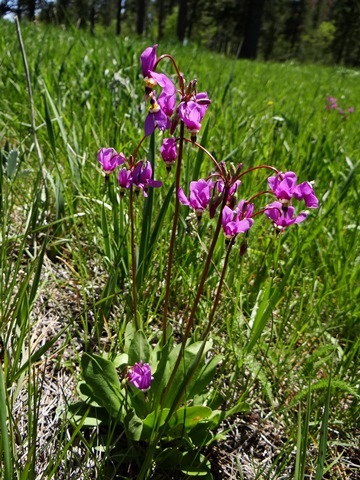 In small roadside streams near timberline. 10854.05 Ex High Atlas, Jbel Toubkal, Morocco, 2200m. Rosettes of whitish-tipped, linear leaves packed into tight cushions bear globose clusters of yellow flowers on short scapes. Draba juniperina (Brassicaceae) (8x10,Z4,P,L,3:4w) ............................................... 70 seeds / $3.50 50888.46 (W) Daggett Co., UT, 5500ft, 1675m. 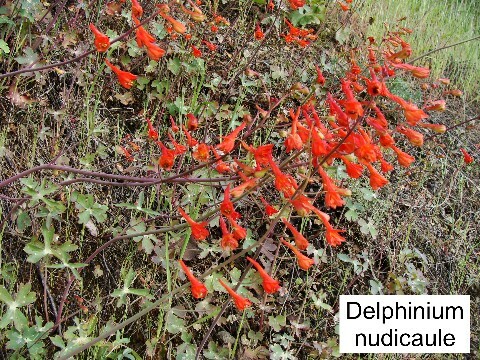 Essentially a robust form of D. oligospermae with more numerous and taller racemes of yellow. Draba oligosperma (4x7,Z3,P,L,3:4w) ............................................................................ 90 seeds / $3.50 65446.53 (W) Albany Co., WY, 10100ft, 3079m. Miniscule, silver-gray, button-like rosettes carpeted with rich yellow. 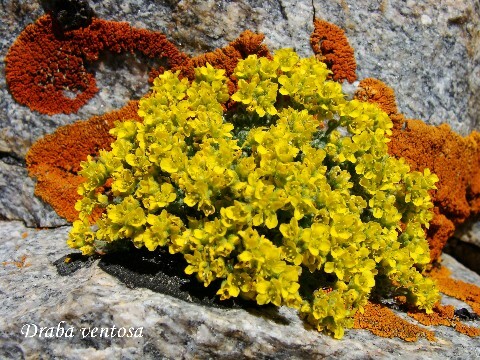 Growing in open alpine rocky areas. 76567.37 (W) Mineral Co., CO, 8500ft, 2590m. Loose mats of blue-gray leaves bear myriad racemes of creamy-white flowers. 76840.20 (W) Iron Co., UT, 10600ft, 3230m. Dark green rosettes with racemes of comparatively large white flowers. 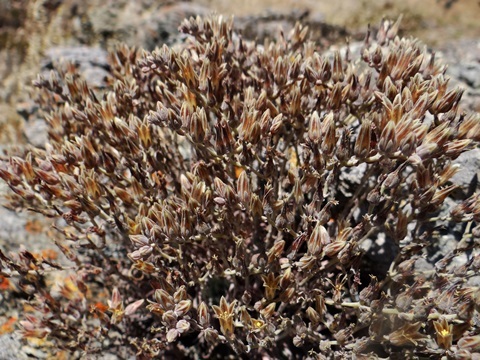 An alpine species growing on dry, eroded, gypsiferous soils. Dracaena draco (Dracaenaceae) (400x300,Z10,P,SL,2) ............................................... 10 seeds / $4.00 15743.14 "Dragon Tree." A succulent with sword-shaped blue-green leaves which may be grown as a houseplant or grown outdoors in frost-free areas where it will attain tree-like dimensions over time. This seed from a population in N Italy. 76971.14 (W) Tulare Co., CA, 5600ft, 1705m. Fantastic dense furry carpets. Coiled cymes of white flowers. Dudleya farinosa (mixed) (12x10,Z10,P,L,1) ........................................................... 100 seeds / $5.00 30104.38 (W) Sonoma Co., CA, 100ft, 30m. 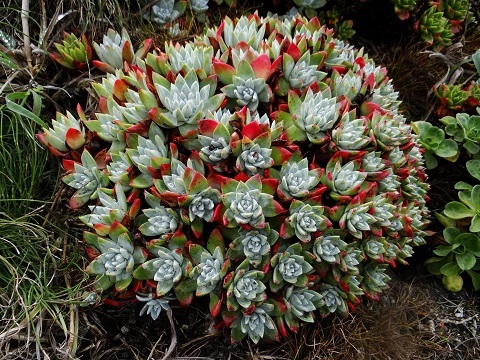 A mix of the glaucous, chalky-gray rosettes and the glabrous, green rosettes, all brightly tipped with red. I saw no evidence of intermediate characteristics. Pale yellow inflorescences on short stems. Photo1 Photo2 Note: I do not have large quantities left, only single packets. Echinacea pallida (Asteraceae) (80x40,Z5,P,C,3:4w) .................................................... 50 seeds / $3.00 70100.04 Pale purple to pink flowers in early to mid-summer. Echinacea paradoxa (Asteraceae) (120x45,Z4,P,C,3:4w) .............................................. 50 seeds / $3.00 70116.14 This Ozark native has large golden-yellow flowers on plants 3 to 5 feet tall. Great for back borders. Echinacea purpurea (100x50,Z4,P,C,3:4w) .................................................................... 50 seeds / $3.00 70916.04 Flowers are a pinkish-red to pinkish-purple over a long period in the summer. Echinacea tennesseensis (Asteraceae) (50x40,Z4,P,C,3:4w) ......................................... 40 seeds / $3.50 78298.04 Rose-purple flowers with coppery disks appear nearly all summer over dark green, rigid foliage. Echinocactus horizonthalonius (Cactaceae) (10x14,Z8,P,GL,3:4w) ............................... 25 seeds / $4.00 35714.33 (W) Hudspeth Co., TX. JRT4222 Single thick bluish-gray stems with thick grayish-black spines. Beautiful flowers in dark to light-pink shades. Echinocactus texensis (Cactaceae) (9x16,Z7,P,GL,2) .................................................. 35 seeds / $3.00 78334.15 (W) Roosevelt Co., NM, 4000ft, 1220m. JRT5211 Robust, hardy plants with variable spine lengths. Flowers in all combinations of white, red, pink and orange.